One of the most solemn and eerie memorials we ever visited was the Pearl Harbor Memorial situated over the sunken Arizona in Hawaii. From the deck you can easily view the remains of the lost battleship that serves as the final resting place of hundreds of brave soldiers. You can see and smell the still leaking oil from the steel tomb rising to the surface. The legend is that as long as there are survivors of that attack the oil will continue to rise to the surface as a reminder and a sign from their shipmates below. 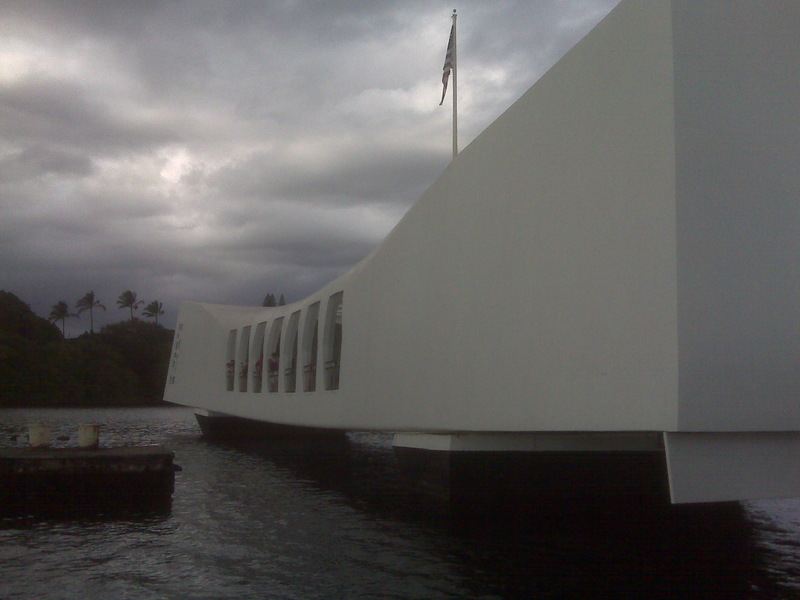 It’s an experience that pierces the hardest facades and causes one to remember the tragic losses of that infamous day. April 14th, 1984. We received a call at the office to return home immediately-there was a fire. Upon pulling into the parking lot of our apartment complex we were in shock to see the burned out frame of what was just an hour before, our home. We were left with the clothes we wore to work that day. Nothing survived-except one sole box that held a collection of ribbons I had won in High School during my Track and Field Days. I still have that box tucked safely away in my garage. It is my reminder of the events of that day. Our lives are built around a series of markers, or memorials, some of pleasant events and others of painful experiences. They are left behind to tell us that something significant happened in our lives on this particular day or at this certain location. We may not even recognize the markers that we encounter. Our mates are a marker of the day we entered into the marital commitment, a pleasant day for most. Our kids are walking markers of the day love brought forth shared life. April 15th is a marker that reminds us that it’s time to pay our increasing tax burden for the freedoms we enjoy. The American Flag is a constantly waving reminder that even though she is sick and maybe not what she used to be, she is still the greatest country in the world. No one is trying to escape our borders. As believers we have several memorials left behind for our observance. The rainbows that appear after a heavy storm are God’s reminder to us to never destroy the earth for our sins and disobedience to Him. The communion we receive is done in remembrance of the love and the sacrifice of our Savior as He gave up His body and blood for our good. Christmas and Easter and the Passover are calendar memorials that commemorate the events of the Bible that are central to our faith. The cross we wear around our neck or tattoo on our body is a memorial of the ultimate expression of love that is just as fresh to day as it was over two thousand years ago. On This Memorial Day we pay tribute to the brave men and women who served, who lost limbs, who suffered tragic burns in explosions and who paid the ultimate price of their lives so that we could bicker over religious freedoms, argue over Constitutional rights, blame everyone but ourselves for our current status and yes, even stomp Old glory and burn the Holy Bible. The freedoms we were blessed by God to be born into did not come cheap. There was a heavy toll paid for our freedom. We must never forget that. And the eternal life and salvation that we were born again into also came at a heavy price-we must never forget that either. God bless you this Memorial Day, God bless and have mercy on America.